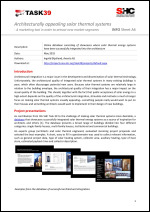 Architectural integration is a major issue in the development and dissemination of solar thermal technology. Unfortunately, the architectural quality of integrated solar thermal systems in many existing buildings is poor, which often discourages potential new users. Because solar thermal systems are relatively large in relation to the building envelope, the architectural quality of their integration has a major impact on the visual quality of the building. This should, together with the fact that public acceptance of solar energy to a high extent depends on the quality of the architectural integration, stimulate and motivate a much stronger focus on making solar thermal systems visually appealing– something people really would want to put on their houses and something architects would want to implement in their design of new buildings.